SARAJEVO, Bosnia-Herzegovima — Four days after the leaders of seven major industrial democracies demanded an end to Serbian military offensives in Bosnia-Herzegovina, Serbian nationalist forces on Saturday began a major assault on the last big Muslim-controlled town in eastern Bosnia. The attack by the Serbs on Gorazde, about 70 miles east of Sarajevo, threw the Bosnian government into further desperation. President Alija Izetbegovic, returning here on Saturday afternoon aboard a Western relief flight from a meeting on Thursday with President Bush in Helsinki, was greeted by angry demands from Bosniak fighters that he release scarce stocks on ammunition for an attempt to break through to Gorazde. With the capture of Gorazde, where 50,000 people are under siege, Serbian forces would be freed to concentrate attacks here on Sarajevo, the capital. Bosnian government force in Sarajevo are being weakened daily by diminishing supplies of ammunition in their attempt to withstand shelling and the Serbian siege. Sarajevo has been under renewed heavy bombardment by the Serbs for the last three days, in the wake of the declaration by the leaders of the seven economic powers, issued in Munich on Tuesday, demanding that Serbian forces stop attacking Bosnian towns. A 55,000-man Serbian nationalist army, with heavy weapons from the Serbian-dominated Yugoslav national army, has been used to create what Belgrade says will be an independent state on two-thirds of the territory of Bosnia-Herzegovina, a former republic in the old Yugoslav federation. But there had been hope here that after the Helsinki and Munich meetings, the Serbian force would at least pause. Except for Sarajevo, no Bosnian town has faced as bleak a situation as Gorazde, where 50,000 people — Most Muslims, 23,000 of them refugees from previous Serbian attacks elsewhere in eastern Bosnia — have been surrounded and cut off from supplies for more than three months. Amateur radio operators who have been the only link with the outside world have said that Gorazde’s people have been eating grass, that 15 children a day are dying of malnutrition and other deficiency diseases, and that surgery on the wounded has been carried out without anesthesia. Maj. Sefer Halilovic, the government’s military commander, said the Serbian forces moved columns of heavy armor toward Gorazde over a 48-hour period and attacked at dawn on Saturday from three sides. 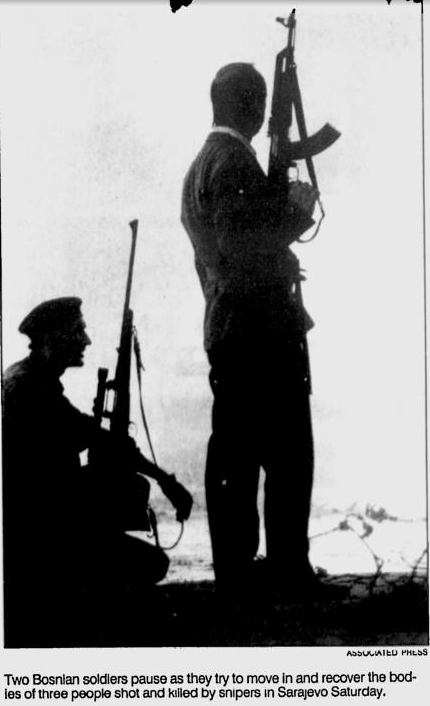 An amateur radio operator’ report quoted in a Sarajevo broadcast called the situation after a six-hour bombardment “hellish,” with much of the town burning from shells, and heavy casualties taken by the town’s defenders. Top government officials said that they doubted that the defenders could last more than a day or two before Gorazde, like every other Bosniak town in eastern Bosnia, fell to the Serbs. In Sarajevo on Saturday a rocket-propelled grenade fired from the Serbs’ hillside positions narrowly missed a U.N. armored personnel carrier heading into the city at a point midway between U.N. headquarters and the Bosnian Presidency building. When U.N. soldiers emerged from the vehicle, they came under sniper fire from machine-gun and anti-aircraft weapons, and, their headquarter said, two civilians were killed. The Bosnian government put the toll at three dead and three wounded. Izetbegovic was expected in the city at about the same time in a similar U.N. vehicle, which was bringing him from the airport. When he arrived, he seemed studden by the worsening situation, including the attack on Gorazde, and the fears among his officials of more massacres of Muslims. The Bosnian government has estimated that more than 50,000 people, most of the Muslims, have been killed so far in the three-month war, and that 1.5 million people, a third of the population, have been driven from their homes. Izetbegovic had approached the encounter with Bush as a last -chance opportunity to appeal for Western military intervention to end the siege of Sarajevo as wella s other Serbian attacks. Failing to persuade the president to bomb Serbian gun position saround Sarajevo, Izetbegovic next hoped for a pledge of American weapons. Bush gave neither, and the strong condemnation made of Serbia and its forces by Bush, by the leaders of the G-7, were seen here as a poor consolation prize.